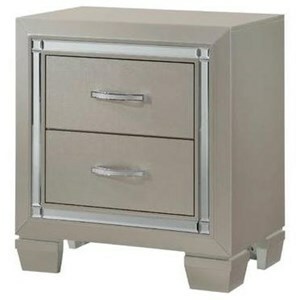 A slim profile dual USB charger located on the back of the night stand adds modern functionality. It is a great way to charge your cell phone, tablet, or other electronic device at your bedside without any additional clutter. 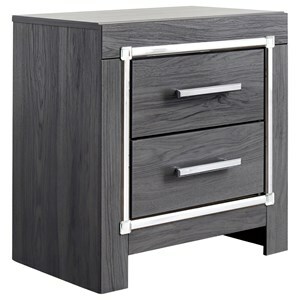 The night stand's high gloss black finish offers a subtle contrast to replicated walnut grain panels on its drawer. 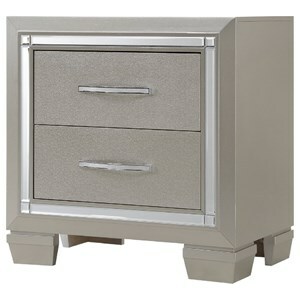 A silver glitter accent panel and faux crystals on the drawer pull add even more glam style. 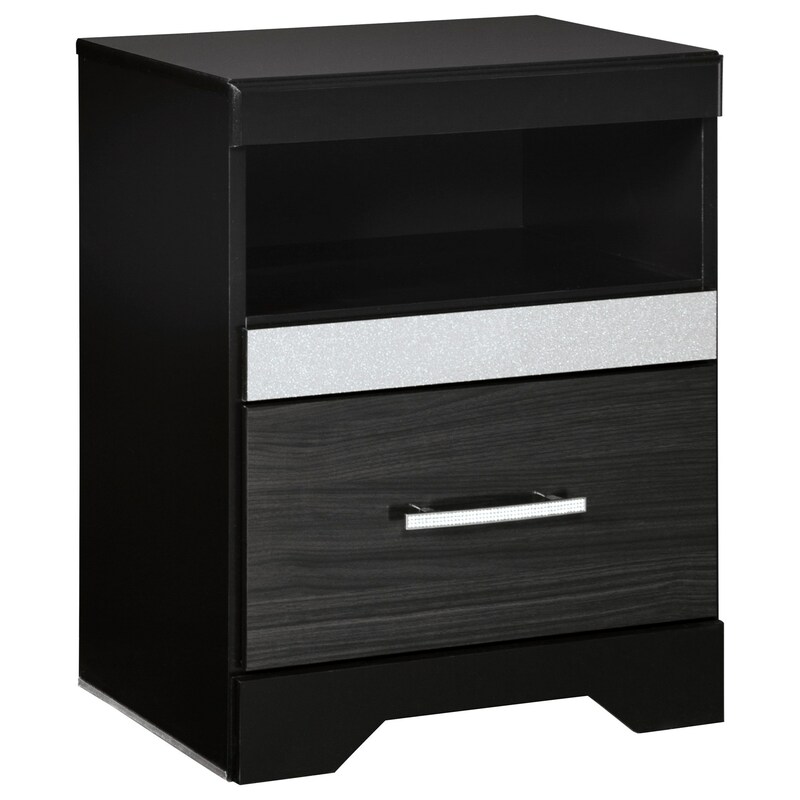 The Starberry Glam Black Finish One Drawer Night Stand with USB Charging by Signature Design by Ashley at Household Furniture in the El Paso & Horizon City, TX area. Product availability may vary. Contact us for the most current availability on this product. 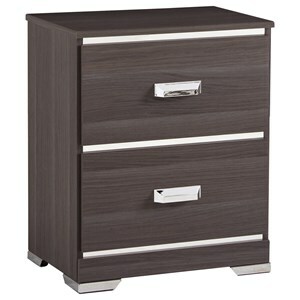 Case Construction High gloss black finish with replicated straight silver walnut grain framed in a black finish. 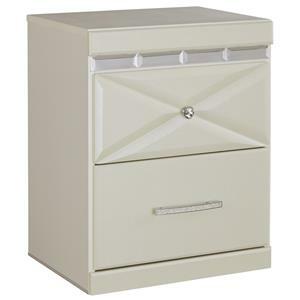 Moldings and jewelry drawer fronts finished in a glitter material. Glam meets contemporary with this bedroom collection. 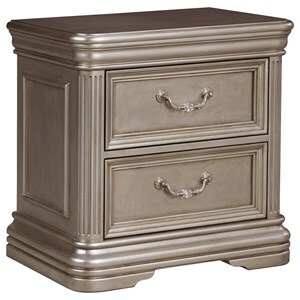 Choose from several bed styles to fit your style preference. 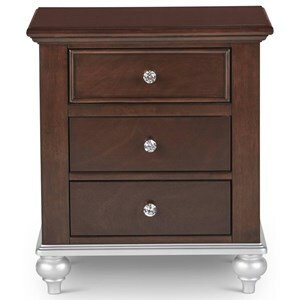 Glitzy accents, such as silver glitter accent panels and faux crystal drawer pulls on the drawers, add fun design that complements the high gloss black finish and replicated walnut veneer. The Starberry collection is a great option if you are looking for Glam Contemporary furniture in the El Paso & Horizon City, TX area. 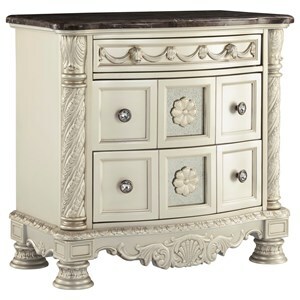 Browse other items in the Starberry collection from Household Furniture in the El Paso & Horizon City, TX area.